Who needs files when we have the web. I just Googled Leslie Elton and found that he wrote and directed a series of animated cartoons in 1918-1920. Here's the link. 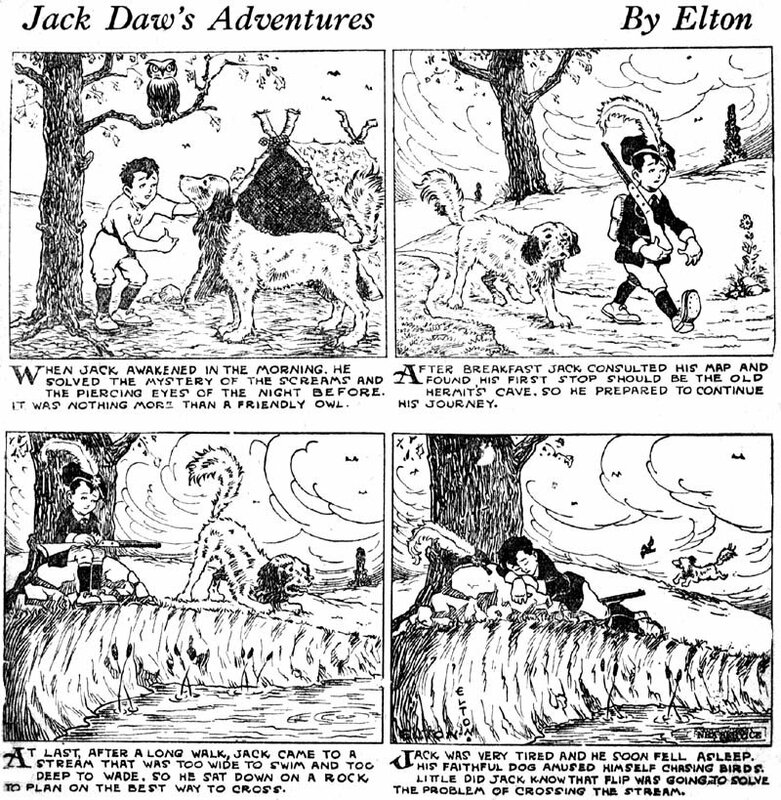 Les Elton did a couple of sound cartoons in the early 1930s that are coming out on a DVD called "Cultoons" Vol. One. They are "Monkey Doodle" and "The Hobo Hero". 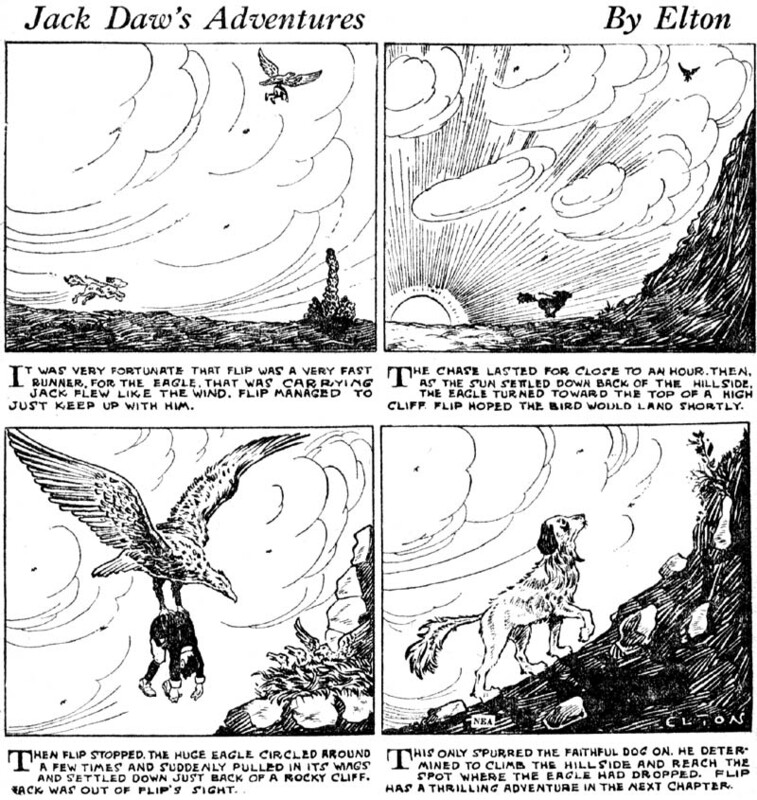 Elton was a very eccentric draftsman and animator! He deserves to be better known. 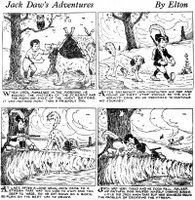 Can you suggest any sources for more info on Elton? 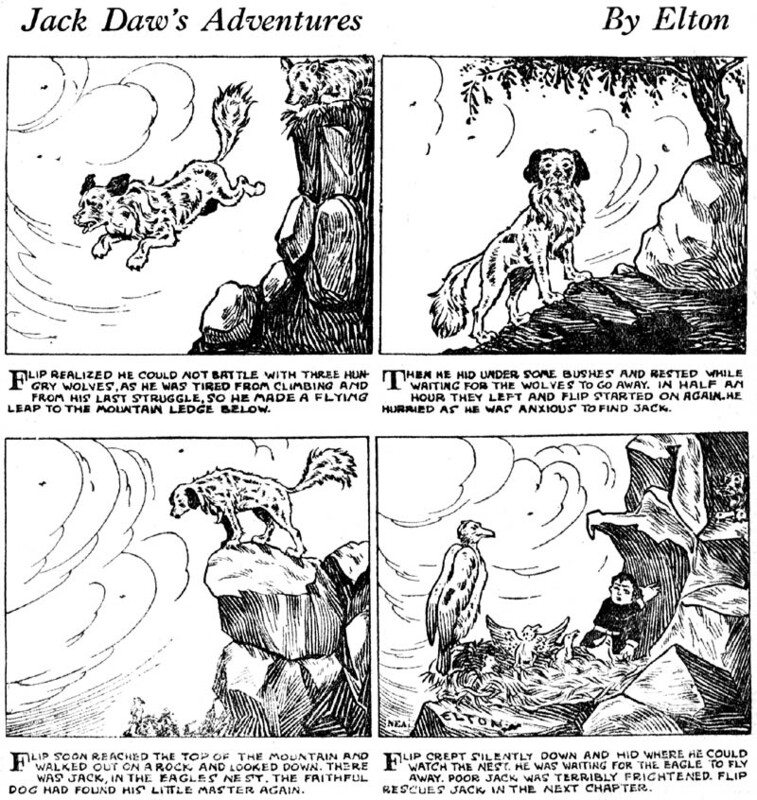 Graham Webb in his 2000 book THE ANIMATED FILM ENCYLOPEDIA, had Elton doing animated cartoons back in 1917-1918. 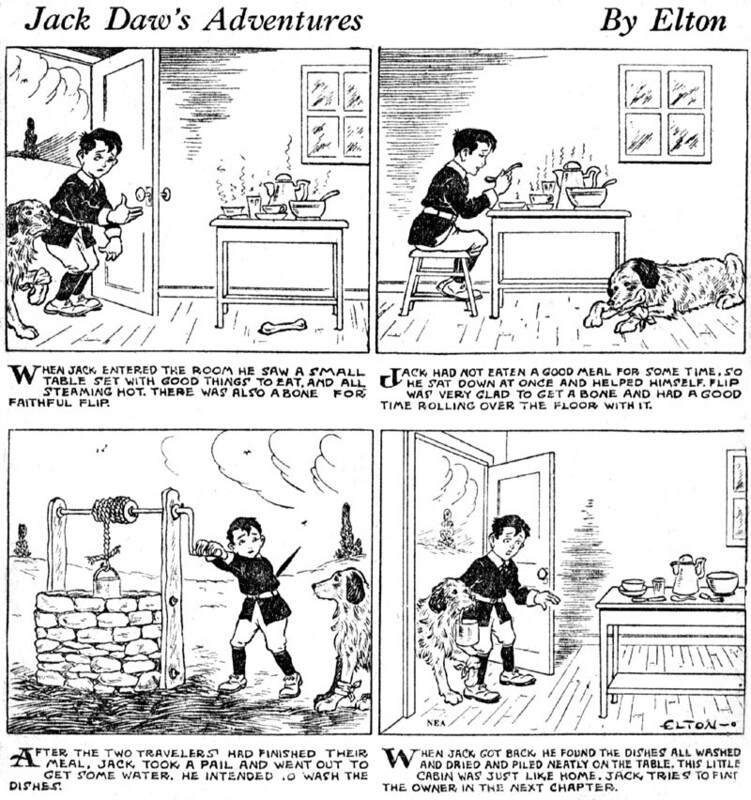 The two cartoons mentioned by Mark Kausler star Simon the Monk, released in 1930 by Kopfstein. 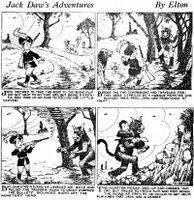 there are only a handful of books dealing with silent cartoons, and all of mine are unavaiable -- except for Donald Crafton's BEFORE MICKEY (1993 ed). 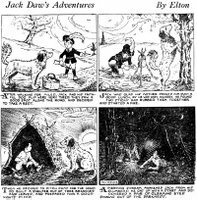 he mentions on page 149, that "Leslie Elton, a newspaper sports cartoonist, joined (J. R. Bray) in September 1916 and took over the "Heeza Liar" series." 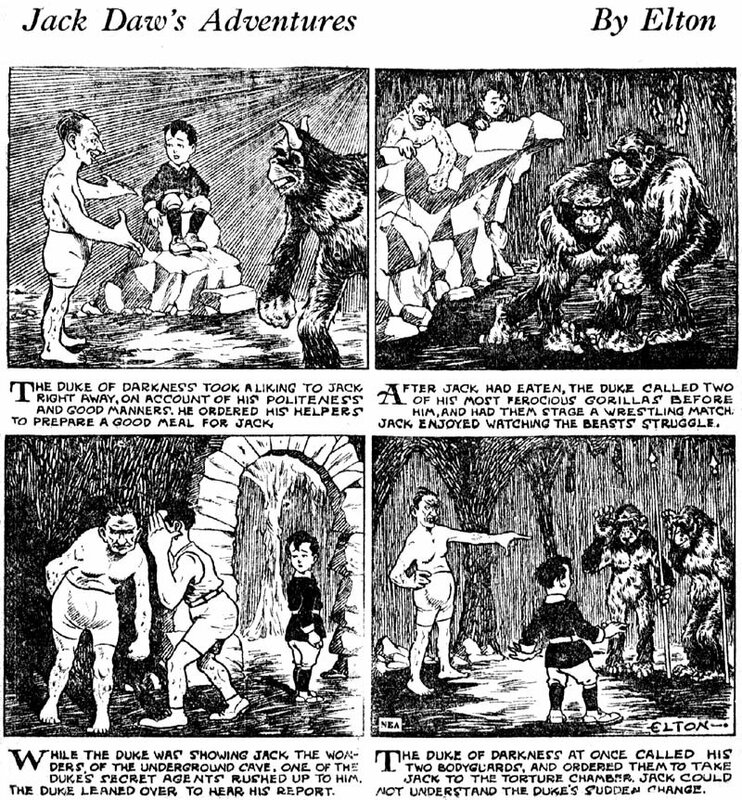 p269 mentions Elton joining Universal in 1919.
p273 "in the hands of Elton and (Vernon "George") Stallings, the satiric qualities were deliberately eradicated, and the Colonel (Heeza Liar) became a buffon." Thanks for the info, Steven. 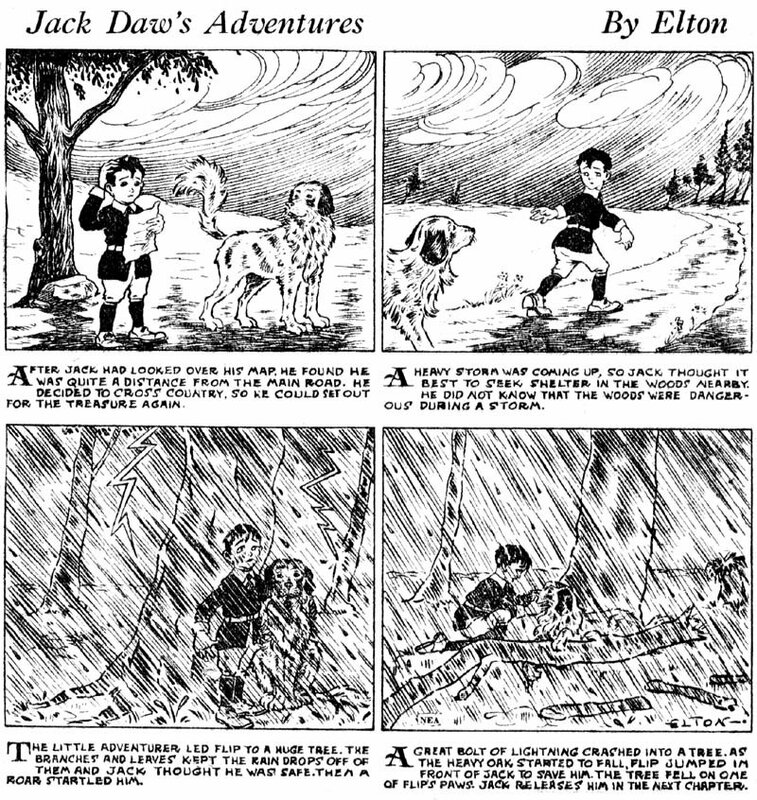 I've never seen Elton's sports cartoons. He must have been a local guy, because I'm sure I would have seen his work if it was syndicated. This blogger has to make a business trip. I'm going to be away from all my precious resources -- scanner, research library and files -- for a week. Does that mean no blog posts for a week? Perish the thought! I'm certainly not going to let my streak of daily postings end right after gamely posting on both Christmas Day and New Year. So I've spent a few long nights slaving over a hot scanner to bring you a very special treat for the coming week. 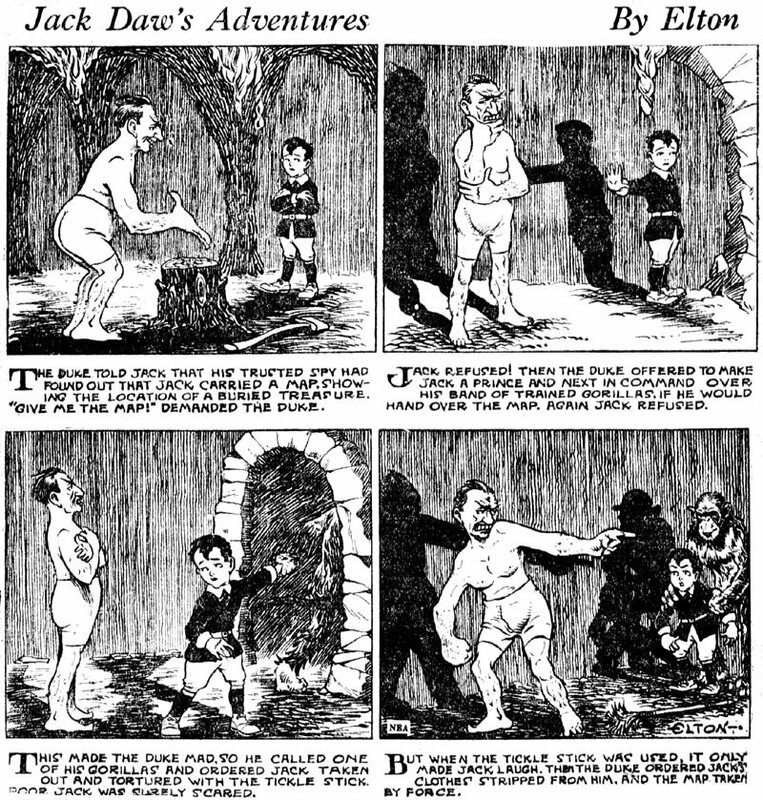 Tomorrow we begin this blog's first extended reprint series, featuring Jack Daw's Adventures starting from the very first strip from July 7th, 1922. 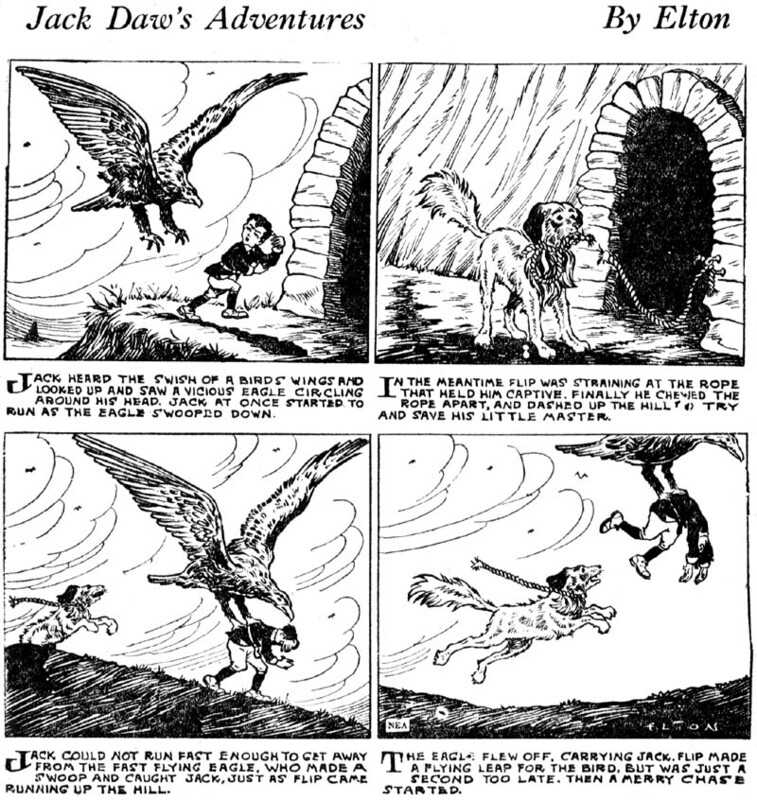 Jack Daw's Adventures is, I believe, the very first syndicated adventure strip featuring a continuing character. 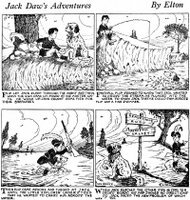 There are a few adventure strips that predate it but they were either local unsyndicated features (Bobby The Boy Scout) or did not use continuing characters (The Evening World's Movie-Story Series). 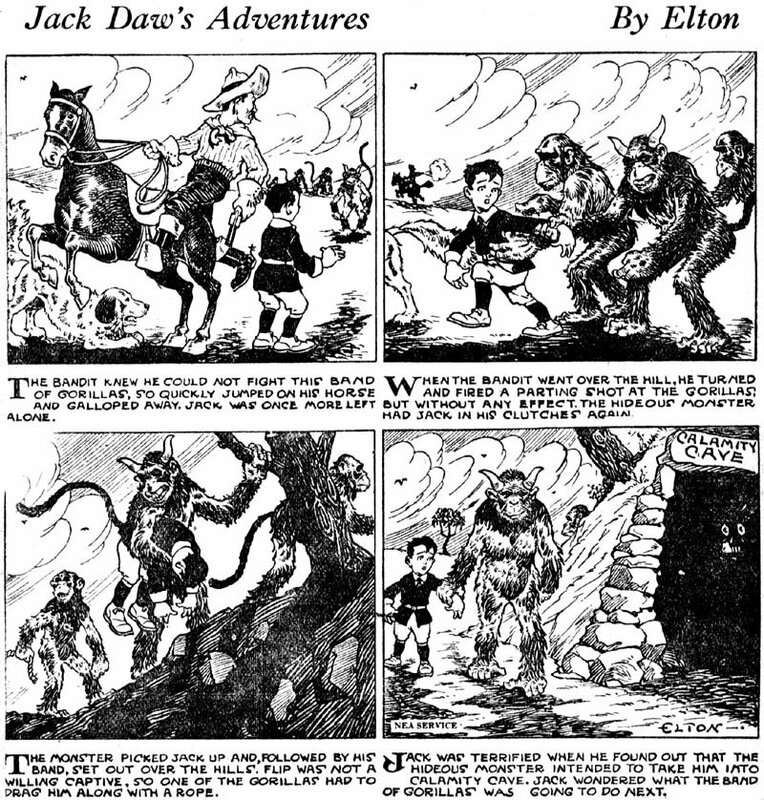 You can read about these and other early adventures strips in my article on the subject in Hogan's Alley magazine, by the way. 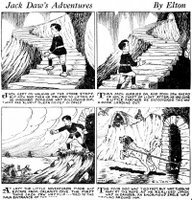 Jack Daw's Adventures is, as the title rather elegantly implies, about a small boy who leaves home in search of adventure. The storyline is all over the map, veering wildly from fanciful fairy tale settings to full-blown serious adventure. 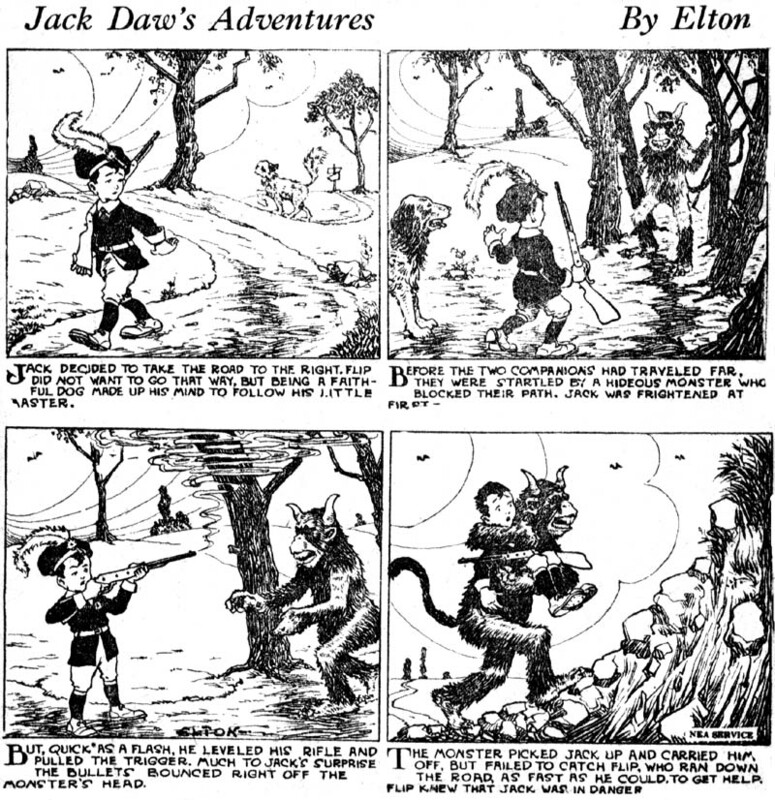 You'll see that odd genre-bending storytelling go from one extreme to the other even just in the first eight weeks of the strip that will be shown here over the coming week. It is, I admit, not a very well written strip. 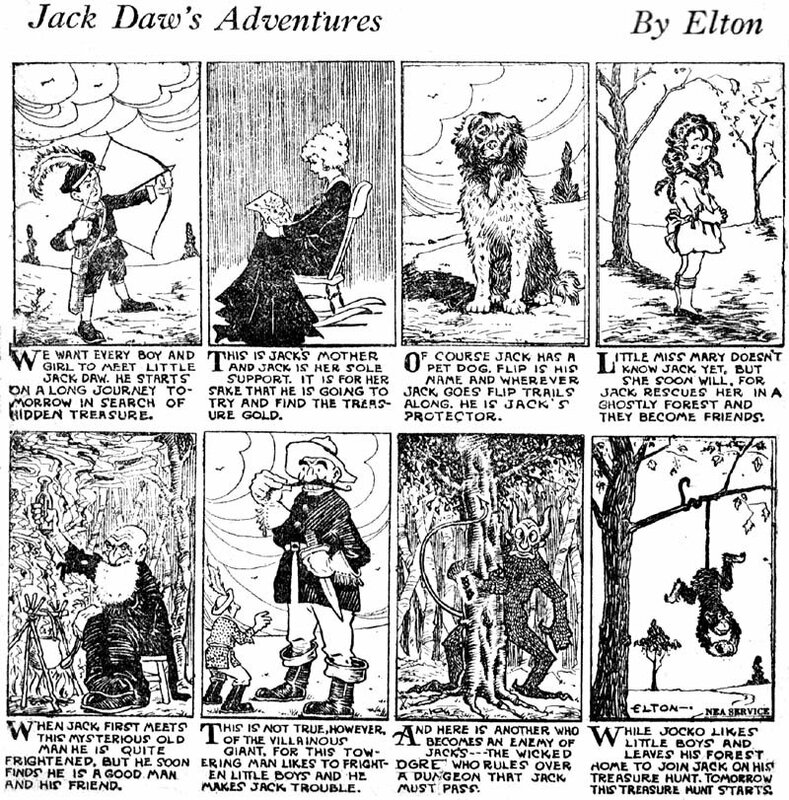 The writer-cartoonist, Leslie Elton, was a passable artist but he seems to have never plotted his storyline out ahead. 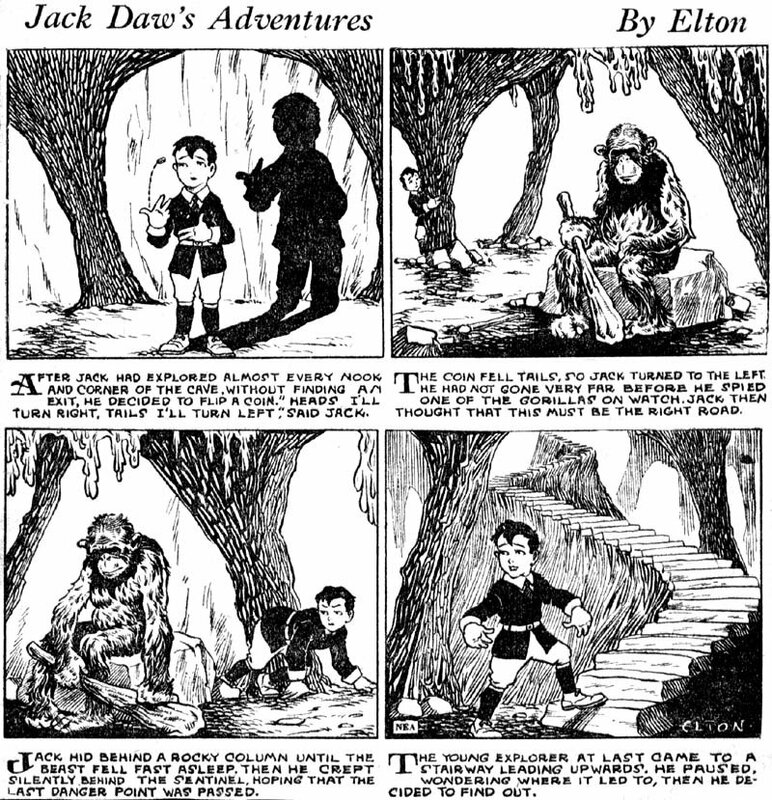 As you read the strips, you'll get the feeling that his story is seldom thought out more than a few panels ahead. This leads to lots of gaping plot holes, inconsistencies and klunky segues. Elton also has a really annoying habit of previewing what's going to happen in tomorrow's strip, even when he ends on a cliffhanger. Jeez, guy, what a way to kill suspense! Still, he's obviously having fun and I hope you will enjoy reading it, even if only for its curiosity value. Over the next eight days I'll post one week's worth of strips each day. The first Jack Daw storyline, though it does not end there, does take a breather at that point so that it makes a good place to stop. 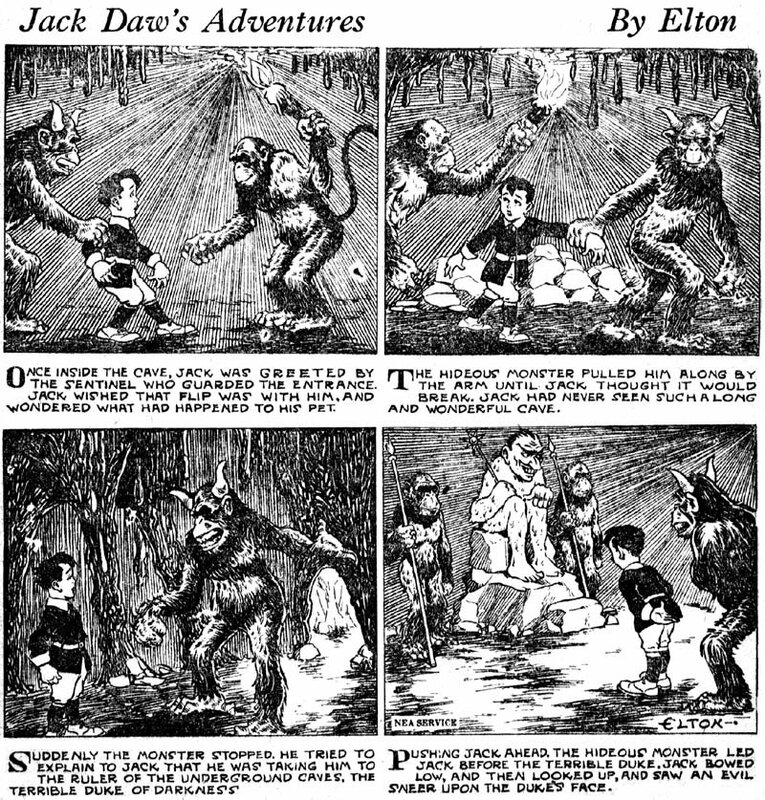 And, since these business trips are threatening to become a semi-regular occurrence for me over the next six months or so, I'd appreciate feedback from you folks as to whether you want to continue with Jack Daw next time I have to resort to presenting a reprint series or if you want me to go on to some other strip. 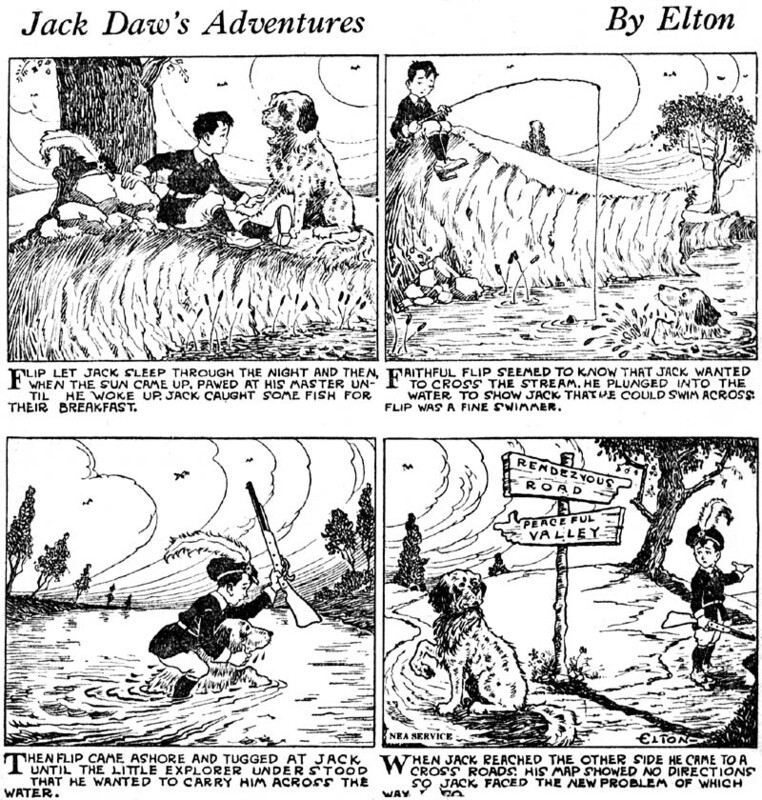 I also welcome any debate you might have over whether this strip actually qualifies as an adventure strip (I know Bill Blackbeard would say nay to that!). There's nothing better than getting mail from you blog readers, and it's an extra special treat when you send me neat stuff . Here are some wonderful Christmas presents received this past week. 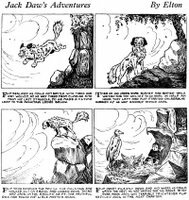 Second, celebrated cartoonist and comic strip historian Alfredo Castelli responds to my Doings Of The Van Loons post by supplying independent confirmation of the starting date based on a run that began at the same time in the Trenton Evening Times. 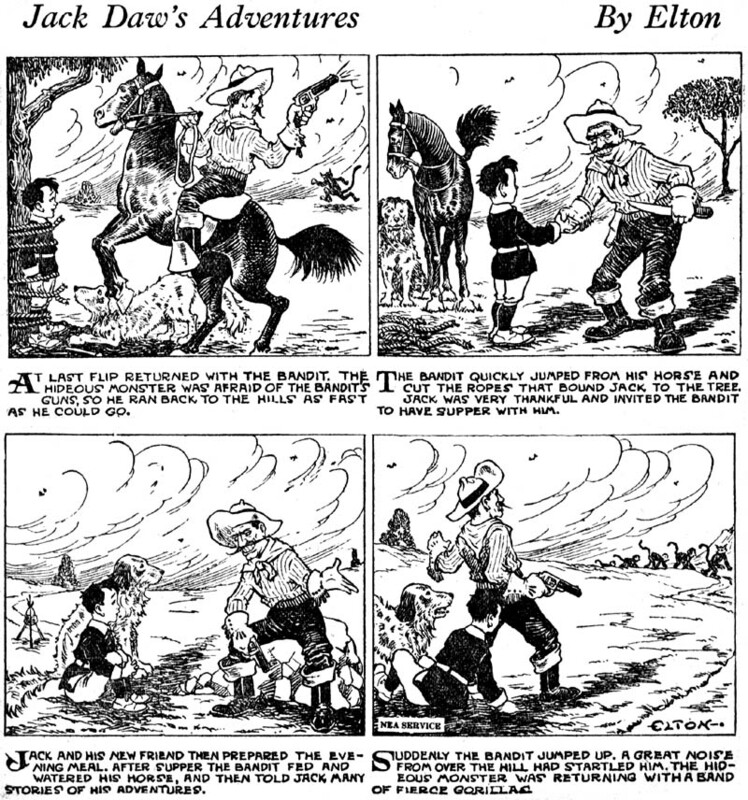 What's particularly neat is that Alfredo's first strip has additional panels missing from the one that ran in the Louisville Courier-Journal. How cool is that? 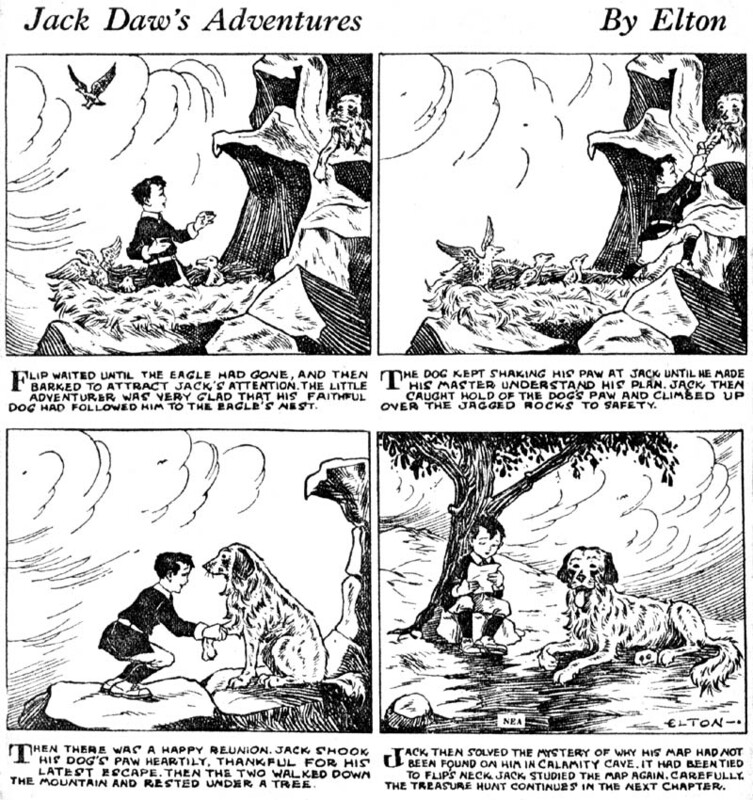 I guess it didn't occur to the brainiacs at the McClure Syndicate that strips can be resized for various column widths, so in order to give their clients the option of running this strips at different widths, they had the cartoonist create drop panels. 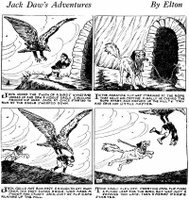 Now drop panels are a standard practice in Sunday comics later on, but they're practically unheard of in dailies of any era. Wow! 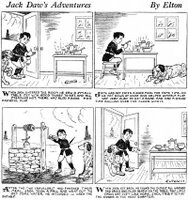 I guess I have to reappraise Leipziger's strip in light of the fact that he had to pad his strips every day. That's a tough row to hoe! 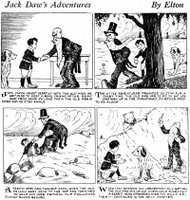 And back to DD Degg, he also tells me that Leipziger's first name is Fred and even supplies a link to a caricature of the man here at the Library of Congress website. Thanks to all who take an interest in the blog, and especially to those who take some of their precious time to comment and contribute! I am reading through the backlogs and hope this comment will be noticed. Says Who was not Stan Lee's only comic strip, of course. 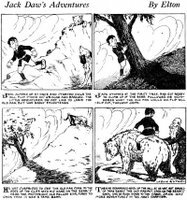 Over at the Timely/Atlas Yahoo group (that's comics, you know) we have been discussing his comics credits. Maybe you can throw some light on that. Says Who was an outcome of something Stan Lee had done earlier in a series of magazines from Marvel's magazine department in the early sixties. 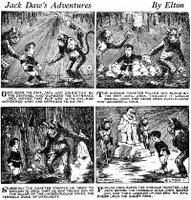 They had a similar title (Who Said That) and contained one photograph per page with a word balloon added. 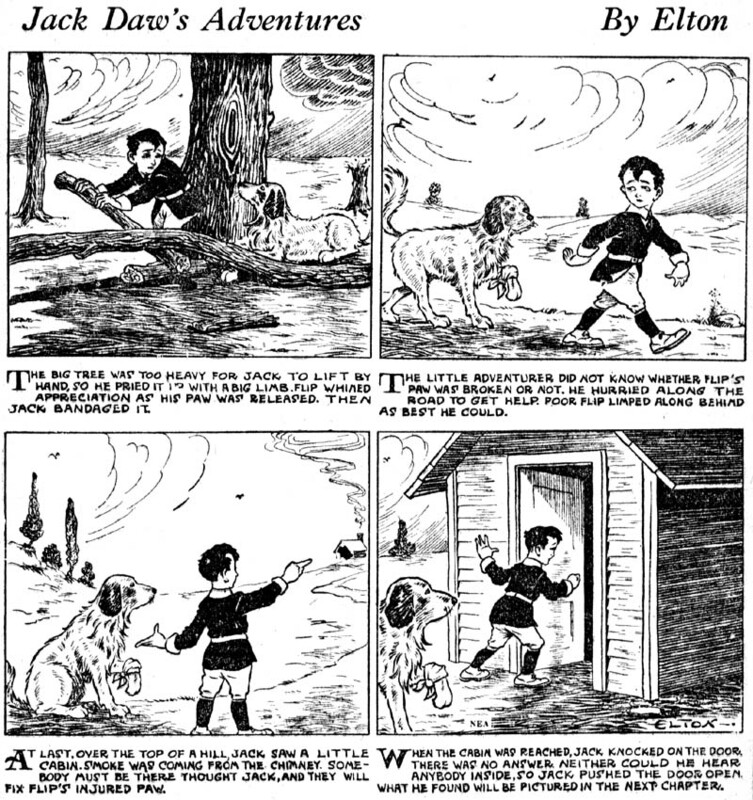 This daily has the advantage of having two 'panels', which seems better. 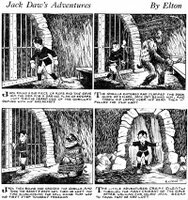 Before that, both Harvey Kurtzman and Nigel Rees (or was ot Roger Price) had been doing similar books. Kurtzman's books are the most famous and can still be found every once in a while. 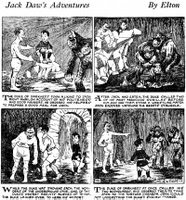 He 'started' doing fumetti in his last satirical magazine Help. The most famous of those, by the way, is the one where John Cleese plays a man in love with his daughter's Barbie (which was where he and Terry Gilliam met - way before Python). But I digress. Before that Stan Lee had done photo's with humorous balloons in his own sairical magazine Snafu. So he may have been the first all along. Here's our list of Stan Lee comics. In the early fifties he is mentioned as the writer of the second year of Howdy Doody. In the late fifties, he started Mrs. Lyons Cubs with Joe Maneely. Maneely sadly died and Al Hartley took over. 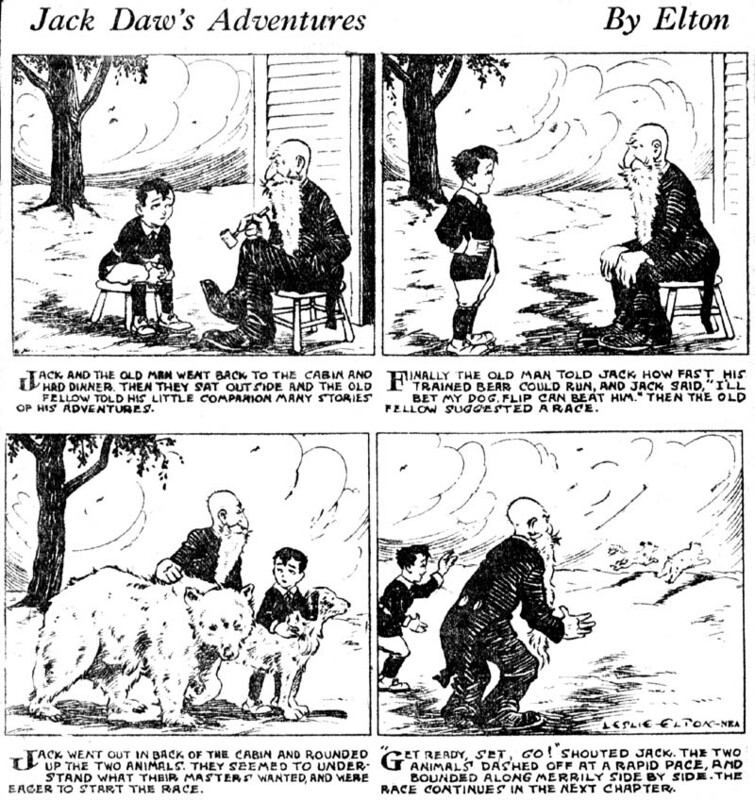 Examples of this strip are very rare. The only one I have seen are from originals owned by Doc Vasalis (article here: http://www.comicartville.com/vassallomaneely.htm). So anything you can give us on that, would be great. Samples, paper names. If your records arn't complete I can probably russle up someone to do some research. 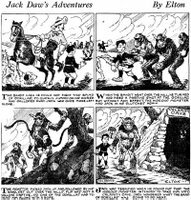 I am in the process of collecting more information for an article about Stan Lee's comic strip work, so more on Who Says would be welcome too. 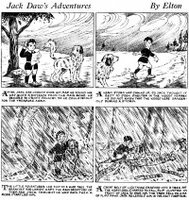 I would add to your list that Stan Lee is believed to have written the final year's worth of "My Friend Irma" comic strips. Regarding "Mrs Lyon's Cubs", I have quite a few examples of the Sunday, but they are all just clippings with no indication of the paper(s) they came from. Sorry! Well I hope you'll come aorund to showing some of them. Are they Maneely's or Hartley's? I suspect Joe Maneely didn't really do to many of them. It may have been a sunday only, as I never saw any dailies. 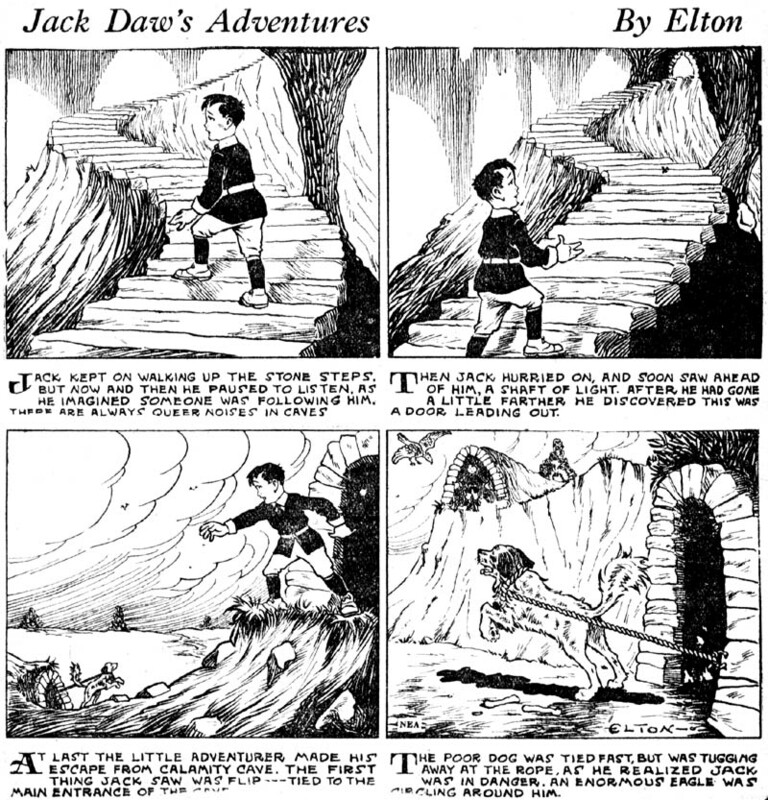 Since writing this (typos and all) I found several early samples of Mrs. Lyons, including some promotional material. New York, Feb 19. 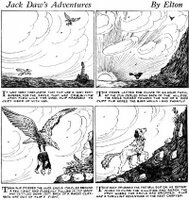 - Mrs. Margaret Pauline Fisher, who in 1912 eloped and married Harry C. (Bud) Fisher, cartoonist, today filed a summons against him in the supreme court. Her complaint has not yet been drawn up. There is nothing in the filed papers which indicates the nature of the action. The summons was served on Fisher. Before her sudden marriage, Mrs. Fisher was a dancer in vaudeville. In June 1913, her throat was cut so that twenty stitches had to be taken in it at an Atlantic City hotel. She said she had fallen in the bathroom on a pitcher and cut herself. In 1914 she received internal injuries in an automobile accident. 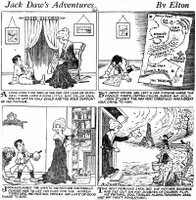 Harry C. ("Bud") Fisher, cartoonist, was married at sea today aboard the liner Leviathan to Countess Aedita de Beaumont, of Paris, according to a message received by the United States Lines. Captain Herbert Hartley, commander of the liner, performed the ceremony. New York, Feb. 8 (By A. P.).- Mrs. Aedita S. Fisher, the former Countess de Beaumont, was awarded. 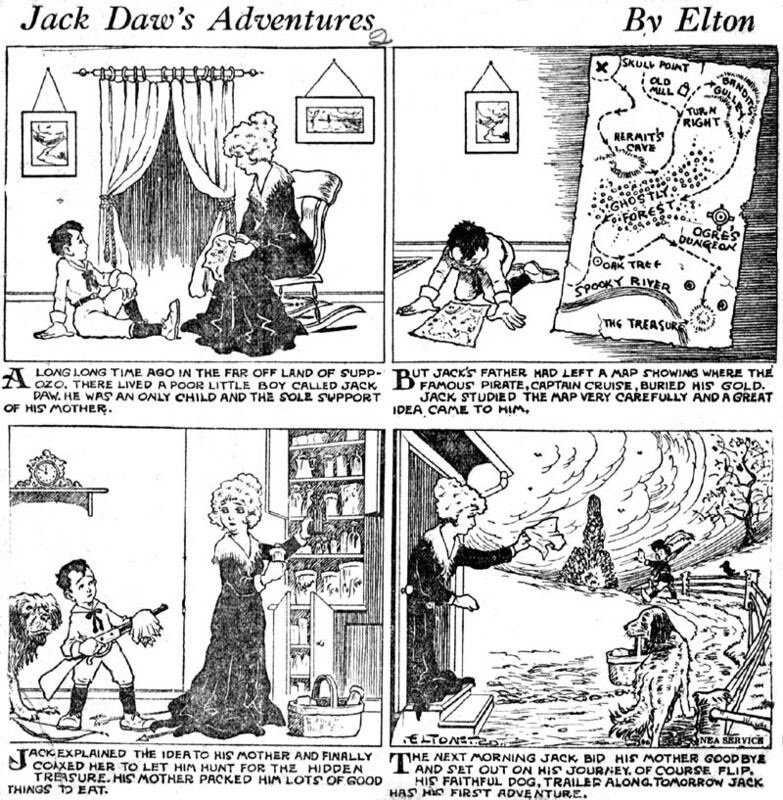 alimony of $26,000 a year today from her cartoonist husband, Harry C. (Bud) Fisher, from whom she was granted a legal separation last week. Mrs. Fisher had been receiving $250 a week temporary alimony and Justice Tierney doubled that amount in setting the permanent figure today. She asked $3,000 a month or $36,000 a year. The Fishers were married at sea aboard the Leviathan, October 24, 1925, by Capt. Hartley. They lived together only a few months, the former countess sailing for Paris the following April, saying she would "never, never" return. 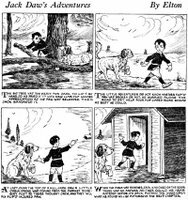 About two months later the separation suit was instituted, Mrs. Fisher charging the cartoonist beat her and threw her out of their fashionable apartment on Riverside Drive. Fisher vainly attacked the validity of the marriage, citing an opinion by Judge Parker of the shipping board, that commanders of American boats have no power to perform. ceremonies. Fisher was at sea when his wife was granted the separation decree, his attorney explaining he was on his way abroad to procure witnesses. 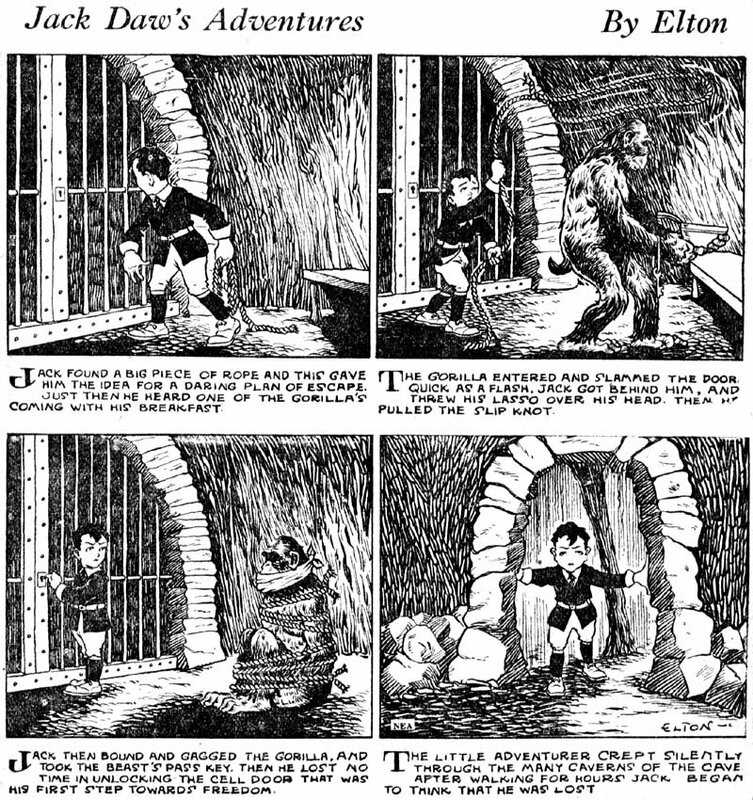 Fisher, it developed at the trial, receives approximately $280,000 a year from his cartoons. New York. 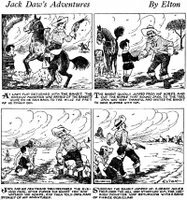 March 17 (By A. P.).- Harry C. ("Bud") Fisher, comic strip artist and turfman, won a point today in the legal tilt with his wife, the former Countess Beaumont. Justice Tierney ordered Mrs. Fisher's separation action, which was decided in her favor by default, returned to the trial calendar. Justice Tierney granted Mrs. Fisher a separation on February 8, awarding her annual alimony of $26.000. 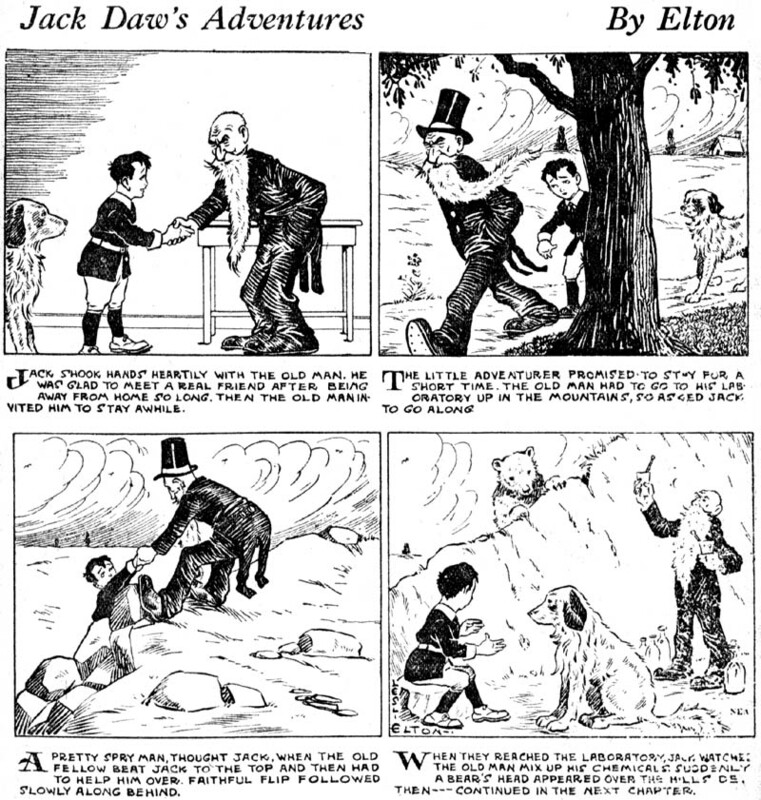 The hearing was held over the protest of counsel for Fisher, who said his client was on the way to Europe to get witnesses who could refute the wife's charges of cruelty and abandonment.. At that time counsel for Mrs. Fisher suggested ironically that Fisher was going abroad probably to get Mutt and Jeff, the characters of his comic strip, to testify for him. 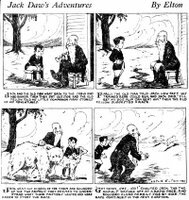 After hearing Mrs. Fisher's story of her life with Fisher, Justice Tierney said from the bench that the cartoonist apparently was the kind of man who drew pictures to amuse children during the day and then went home and beat his wife at night. He also characterized Fisher's drawings as puerile and senseless. "I don't see how any one can pay money for that nonsense," he ejaculated when told that Fisher made $250,000 yearly from his comics. granted the separation he was of the opinion that Fisher's "sudden and unannounced departure for Europe" was to escape jurisdiction of the court. The Fishers were married aboard the liner Leviathan October 24, 1925. and in April of 1926 his wife sailed for France saying she would "never, never return" to him. When she later brought the separation action he raised the question of the validity of a marriage performed by a ship's captain, but Justice Ford ruled the marriage was legal and binding. New York, June 22 (AP) - A jury in city court today held Harry C. "Bud" Fisher, cartoonist and turfman, responsible for the $1,942 bill his wife ran up in the Mayfair Hotel from May 17 to July 8, last year. 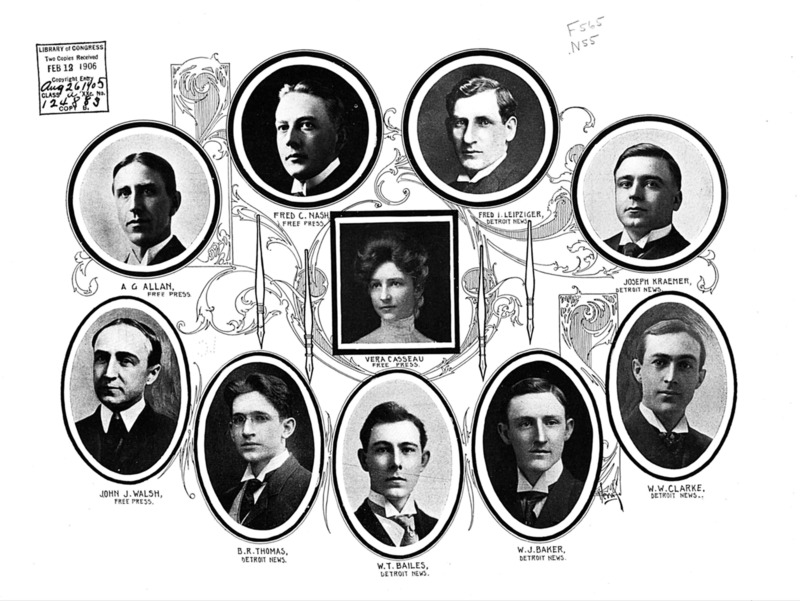 Mrs. Aedita Fisher, the former Countess de Beaumont, who is suing the cartoonist for a separation, was codefendant in the action, but the jury placed the burden upon her husband, Mrs. Fisher testified had an income of $850,000 a year, maintained a 60-horse racing stable at Lexington, Ky., and a $20,000-a-year horse trainer, two automobiles with two chauffeurs, and a valet. 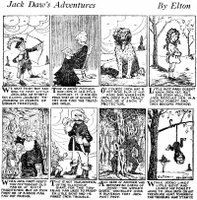 At one time, she said, the cartoonist maintained, in addition to his Riverside Drive apartment, other suites at the Ritz-Carlton, the Marguery and the Mayfair. New York, Sept.19 (AP) - The separation suit of the former Countess de Beaumont against her cartoonist husband, Harry C. "Bud" Fisher, received a setback today when Supreme Court Justice Crain refused to confirm a referee's report recommending a separation and $400 weekly for Mrs. Fisher. The court ruled that the referee, Herman Joseph, had disqualified himself by prematurely demanding his fee for services. Affidavits submitted by Fisher's counsel stated Joseph had demanded his fee at the time counsel for both sides submitted briefs. Denial was made that the amount of fee ever had been fixed, despite assertion of counsel for Mrs. Fisher at the time of the referee's hearings that compensation had been fixed at $25 per hour. Justice Crain, in holding that the referee had disqualified himself, said Joseph's demand was "understandable."